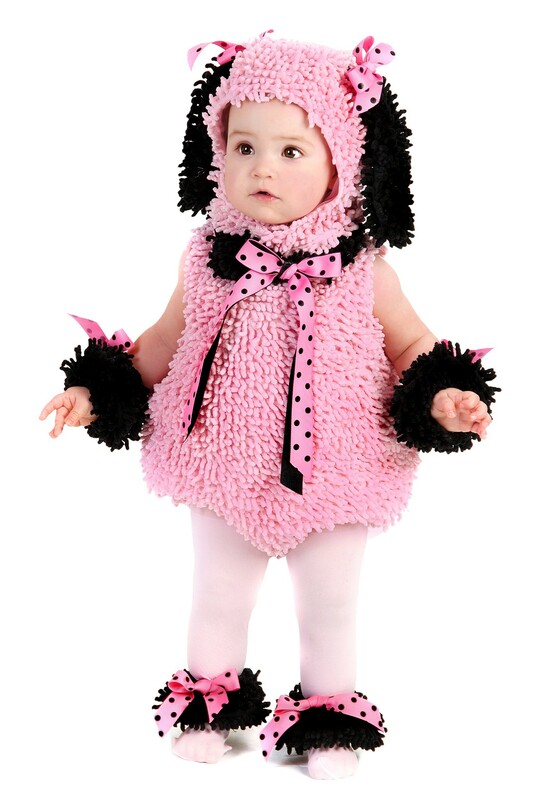 Even the most discriminating cat lover would have to admit that this Baby Pink Poodle Costume is paws-itively adorable. And while some doggy outfits really play up their canine aspects, this one cleverly highlights the features that everybody loves in any cuddly animal companion! Who doesn’t appreciate the shaggy pink chenille coat that covers the romper, or the floppy ears attached to the hood? And the last time we checked, few things get an awwww like a pet decked out in playful polka-dotted bows. These are traits that you don’t find solely in dog costumes or cat costumes: they speak to a part of us that doesn’t care to split hairs when it comes to small, sweet, fluffy creatures! And we don’t want to live in a world where people let their petty differences get in the way of a great-looking costume for tots and toddlers. So don’t be ashamed to pick up one of these delightful poodle suits and get out the camera! Sure, when this puppy is all grown up, he or she might be a little embarrassed by all the photos you took of the time they spent in this cute outfit. But we think you’ll be more than okay with that when you see the prints! I was really amazed with how smooth and fast the transaction and delivery of my orders. The customer service are very helpful and friendly. The costumes are very lovely with good materials used. I would certainly recommend this site.